16 Squadron, the home of the Rooivalk invited The MIG to their base in Bloemspruit to experience this awesome invention but also to meet those responsible for the operation and maintenance of this beast. I have been around the block many times, flown truly great aircraft, met extraordinary people, but this was certainly the pinnacle of my aviation career. 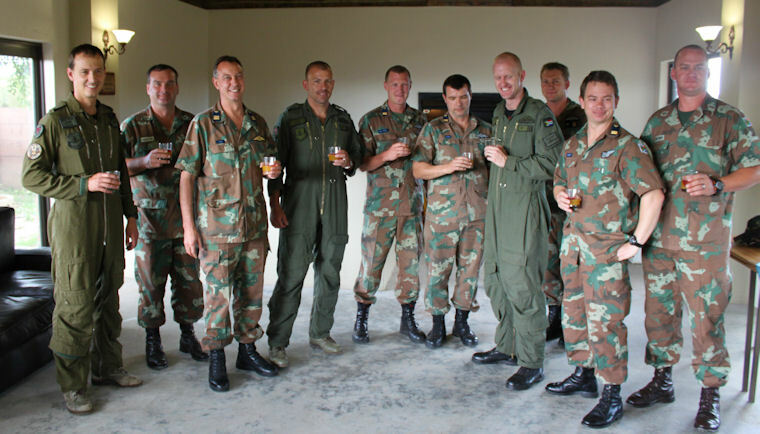 Before I get to the Rooivalk itself, I think that it is important to picture the crew and where they fit in our defence force. It cannot be argued that these guys are fighter pilots but instead of having dinner with a knife and fork after a mission, these guys rough it up and is actually the infantry of the skies. Their purpose is support to the army (in most cases anyway) and in some other countries, they would have been part of the army and not the air force. Although they are airborne and have significant air-to-air capability, they operate at 50ft and with close integration with the ground defence and attack forces. I guess you can call them the “Pongos in Blue” (Pongo is an old South African term used to describe the infantry). The Rooivalk's design philosophy was simple: Do not be seen. If you are seen, do not get hit. In the unlikely event of being hit, sustain flight. If you can't sustain flight, survive!! If we break these components down, it obviously become much more complicated but the principals are easy to identify. Detection Avoidance: The Rooivalk has a small frontal area and it is this part of the aircraft facing the enemy during an attack. Parallel and near-flat cockpit glazing, three-tone camouflage, shielded engine compressor faces and a specialized technique of mixing cold air with exhaust gasses before blowing it into the rotor wash all contribute to reducing detection from a visual, infrared and radar perspective. 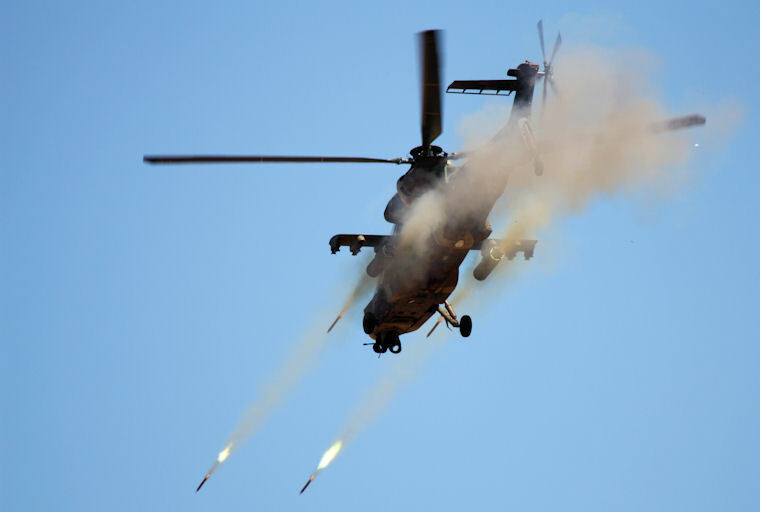 Avoiding Hostile Fire: The ability to fly the nap of the earth is in itself a huge hostile avoidance system but the Rooivalk has many other tricks up its sleeve to protect itself from both ground and air risks. Electronically, it has the capability to detect any radar or laser targeting. It has an air-to-air missiles capability, a potent 20mm canon, long weapon stand-off ranges, high excess power margin in 'hot and high' conditions and is highly manoeuvrable. 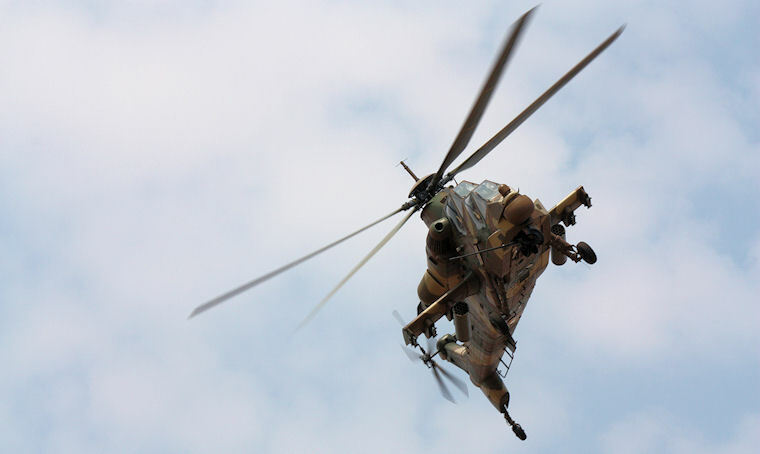 Sustaining Flight: With its 12.7 mm API ballistic tolerance, dual-redundant systems, wide spacing between the engines, dry run capability on all gearboxes, fire protection systems and dual flying controls, there are not many things that will take the Rooivalk out of the skies. Survivability: A sink rate of 1100 ft./min (6 m/s) may result in only limited damage and will probably be repairable by the crew on location. What will happen if you land your aircraft this hard? Only at a sink rate of more than 2000 ft./min (10.5 m/s) will the chances of on-site repairs be considered unlikely. 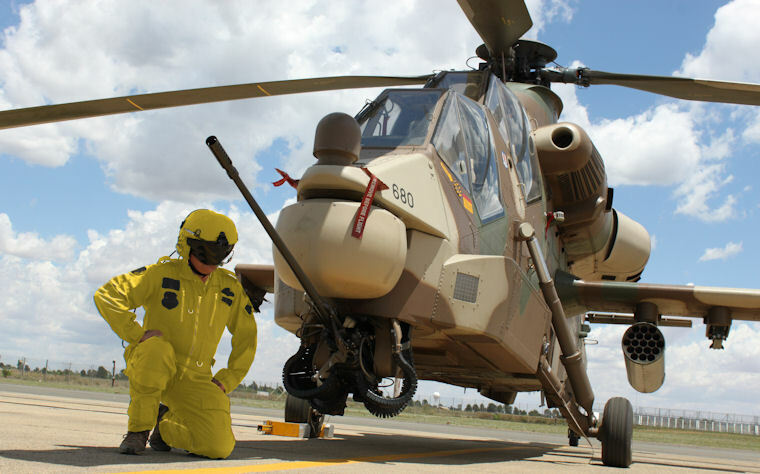 In this case, the Rooivalk is equipped with crash sensors / couplings to turn all fuel and electrical systems off automatically to minimize injury. Attenuating crew seats are added to absorb the impact and the engines with gearboxes are positioned away from the crew. I do not have much military helicopter flying experience and the closest to this is the Mil Mi-8, a Soviet-designed medium twin-turbine gunship (code name HIP) I flew in Sierra Leone many years ago. Regardless of my limitation, I spent enough time inside and outside the Rooivalk to recognise the technical and practical accomplishments Denel achieved when they developed this formidable attack helicopter. 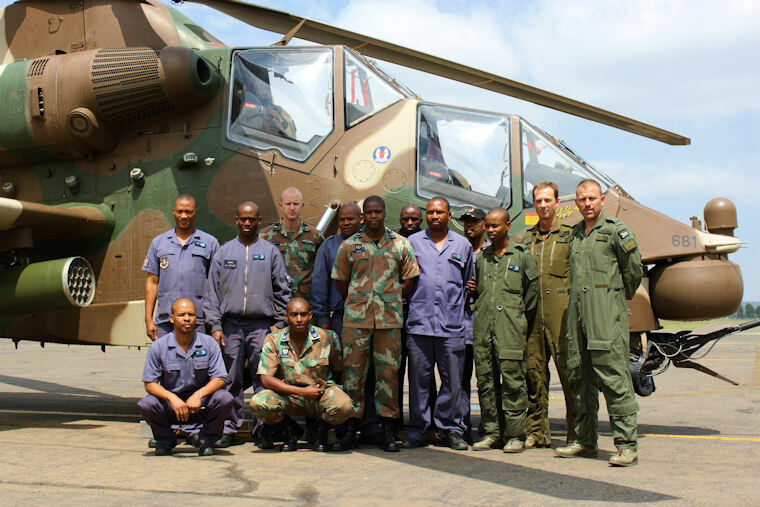 The Rooivalk is a two-crew operated aircraft with the Weapons Officer (WSO) in the front and the pilot in the rear seat. The WSO is usually in command of the mission and the pilot creates the stable platform from which the attack is launched. Lots of computerised systems provide enormous cohesion between the WSO and the pilot, and with the Helmet Mounted Sight and Display system (HMSD), the WSO can even see the focusing direction of the pilot behind enabling them to observe both sides without any verbal communication. Of course the HMSD also provide visual flight information inside the helmet and there is no need for the crew to look at the flight instruments inside the aircraft and therefore allowing them to focus outside where it matters most. Attitude indication, height above ground, airspeed, direction etc. are all in this display. It takes a little bit of practice to get familiar with this system but once you get the hang of it, it is actually very natural and comfortable. I felt comfortable flying the Rooivalk right from the start. With the pilot elevated above the WSO, both crew members have an excellent view. The controls are light, responsive and you can feel the solidity of the platform with every movement you make. Other controls and systems are all either on the flight controls or in close reach and in most cases there is no need to move your hands around. When you need power it is always available and the harmony between bank and yaw is so good that only cyclic movements are required during moving turns and very little anti-torque input is required. The hover is just as sturdy as the platform. With the huge amounts of power available there is hardly a requirement for any collector input and gently reacting to change with only the cyclic makes the hover an easy task. A sideway taxi is equally simple and the unobstructed view through the side window allows this manoeuvre to be as natural as forward flight with the difference that you can do it at significantly high speed. All of these features are of course extremely valuable considering that this will be most of the Rooivalk's requirements as they pounce the enemy while flying low, slowly and most of the time inside river beds or between trees to remain undetected. But when speed becomes a requirement and power to climb fast, the Rooivalk doesn't fail to impress. It is actually astounding to fly in so many different configurations and environments and still doing it without effort or compromise. It is not my intention to blow smoke up the Rooivalk's backside but rather to do that to the enemy and that is exactly with we did during the second day of my visit. Enemy troops were advancing to evade Bloemfontein (of all places) and it was our mission to destroy their air capability and other strategic equipment they had. As the WSO in the front seat my task was to launch the attack and to remain undetected, my Pilot Maj Jonathan Sterling (Callsign “Vagrant”) flew us at extremely low level inside a narrow canyon until we were close to the target. 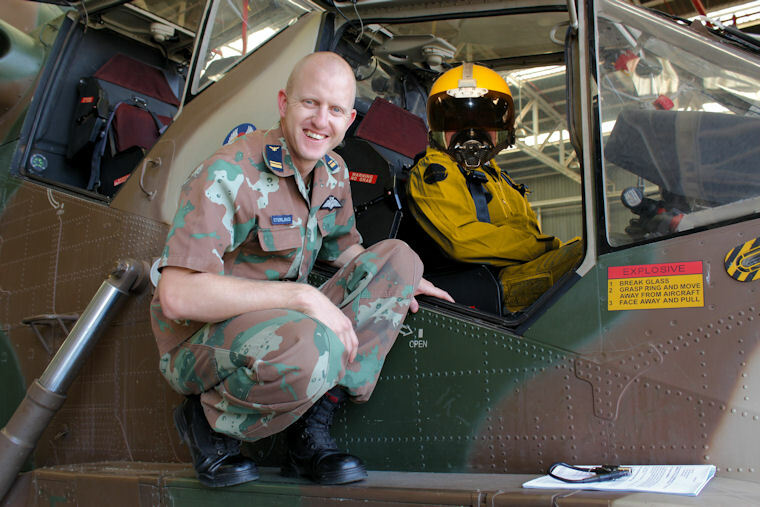 Maj Hugo Visser (Callsign “Vundu”), the WSO in the lead Rooivalk and also commander of the mission positioned all the aircraft in strategic places as we approached. 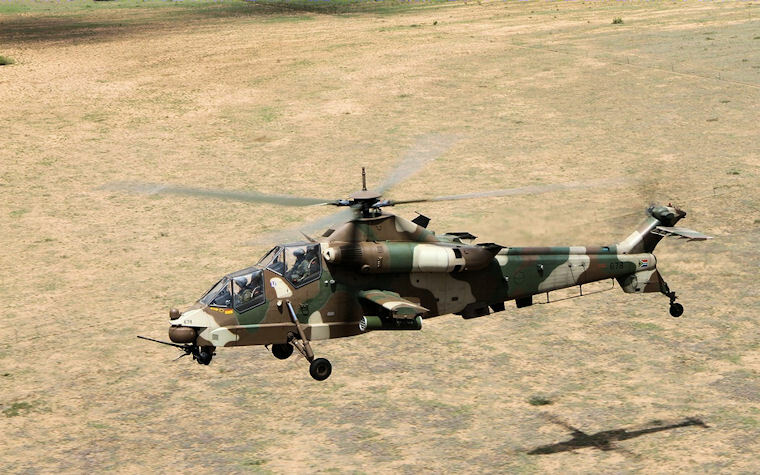 With the Rooivalk's imaging capability we could see the attack zone from far out and without being detected. We could therefore take a moment to reposition and coordinate the attack based on the intelligence the Rooivalk provided and quickly strike with surprise and precision. The WSO has control of all the rockets and missiles while the pilot operates the 20mm canon as a defence mechanism. This roll can of course be changed with the press of a button to ensure that one member of the crew can react to a threat without any delay. The canon's direction will follow the movement of the pilot's helmet making this a truly easy and accurate system. In the attack mode, the HMSD provide additional information and a small diamond shaped indicator ensures that the WSO can align and release the firepower accurately from as far as 9km away. During the attack I could also experience the speed of the Rooivalk. 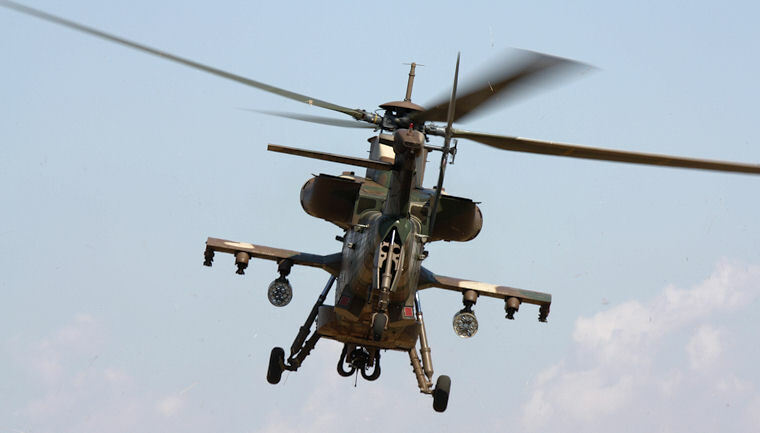 To reduce our vulnerability, we increased speed significantly and the Rooivalk graciously complied with our requirement. The attack capability of the Rooivalk allows for target acquisition, tracking and illumination, all of this through the HMSD system. It can easily be dubbed “Tank Buster” when loaded with the Mokopa missile giving the Rooivalk a stand-off range of 9km, and the versatility of "lock on before launch" or "lock on after launch". 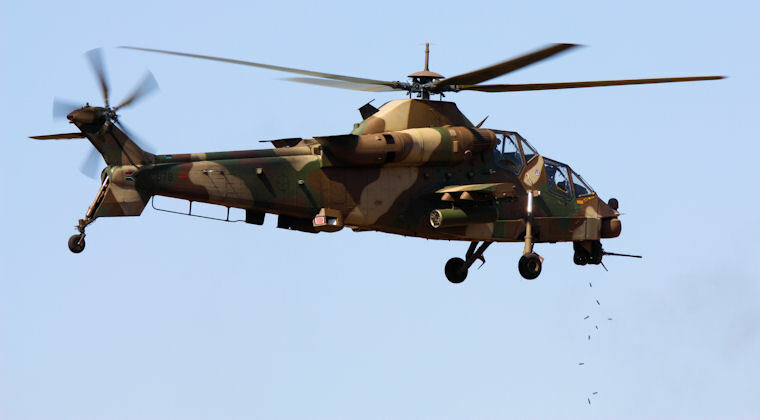 The Rooivalk is capable of carrying two 70mm rocket pods per side with a capacity of 19 rockets in each pod. Air-to-air missiles with heat seeking technology can be mounted on the outside edges of each stub wing. The 20mm cannon controlled with the HMSD or the aircraft main sight is fed from two different ammo bins allowing the use of different ammunition types depending on the target. The ammunition is also compatible with the 20mm ammunition used by the South African Army adding to its versatility. 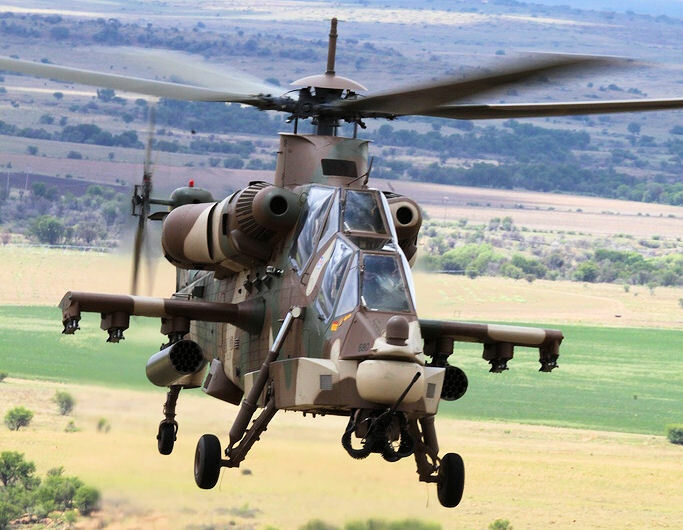 We know that the Rooivalk and its crew are extremely capable but South Africa is not at war and it begs the question what value the Rooivalk could add. Well, it took decades for this capability to be developed and unless it is maintained, it would be a huge loss if the development had to start all over again one day when South Africa is in a conflict situation. Secondly, knowing that there is a Rottweiler in the back yard certainly keeps the unwelcome element at a distance and this deterrent is probably the most important aspect of any military force today. But war is not the part Rooivalk should play in this thousand years of piece we are in today. 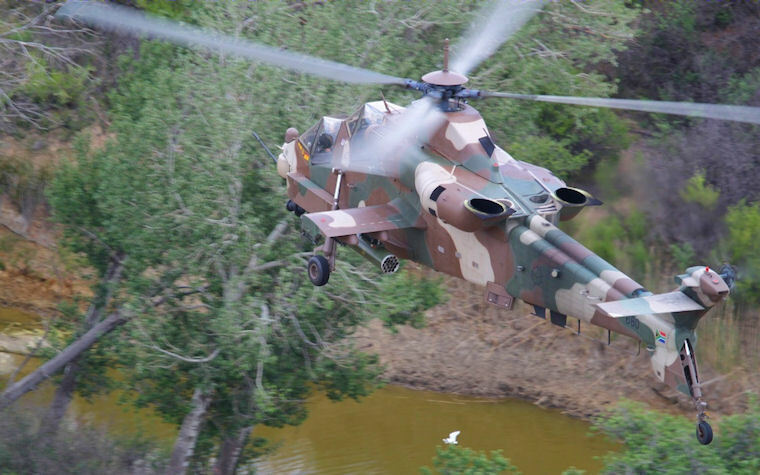 Imagine the value the Rooivalk can offer during peacekeeping missions we so desperately need, especially here on the African continent. Here we do not deal with long range attacks or nuclear threats but rather with gorilla style tactics where vigilance and close defence systems are the only method of curbing the threat. 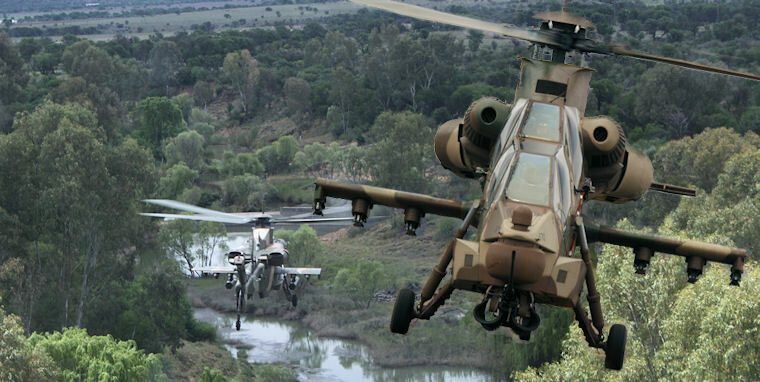 Think about the effect the Rooivalk will have on the maritime piracy situation so common in our lives today. 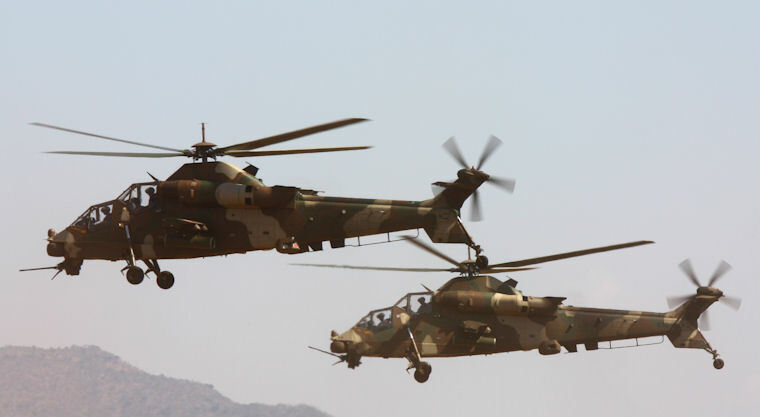 The Rooivalk could also play a significant role closer to home. Although the fighter jets protecting the skies during the Soccer World Cup did a sterling job of creating awareness and visible defence mechanisms, I still want to see a Gripen engage Ossewa Ben-Lategan in his paraglider attacking Soccer City or the Union Building. The Rooivalk however have this capability. It can be deployed closer with significantly reduced reaction time, fly the same speed, effectively communicate and ensure that it is truly a reaction to a threat.